Where the Order values law, the Empyrean values wisdom. Adjudication started from the teachings of Lugus and punishment is not based on adherence to a labyrinthian codex of laws, but from direct consol on the merits of each case. Social equality and impartiality are the model between a government and its citizens as well as between empires. As such the Empyrean gives equal voice to small empires as it does those that dominate Erebus. 1. [tab]Ecclesiastic, disciples responsible for spreading the teachings of Lugus. 2. [tab]Vicars, priests who act as the eyes and ears of their superiors. Vicars have access to the Whitefire spell which does extra damage to vampires. 3. [tab]Luridus, high priests of the Empyrean who have access to the powerful Crown of Brillance spell, an enchantment that does holy damage to all enemies around them every turn. 4. [tab]Radiant Guard, a melee unit that doesn&#8217;t require a building and has access to the Blinding Light spell. 5. 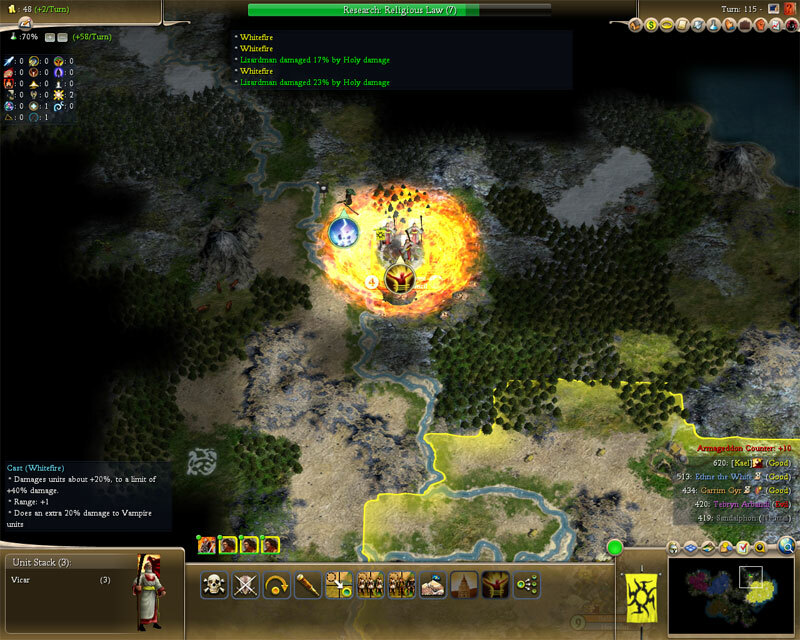 Ratha, strong chariots with the ability to cast the Blinding Light spell and a bonus vs recon units. Any good or neutral player that has researched the honor tech can join the Overcouncil. Being a member grants a significant diplomacy bonus with other members. It also forces members to comply with any degrees that the Overcouncil has voted and agreed on (unless the player wants to defy and leave the Overcouncil). These degrees can enforce a defensive pact between all the members, force war or stop trade with another player, outlaw death, entropy or shadow mana, etc. Overall these laws can be powerful and restrictive. Players that expect to remain members of the Overcouncil should expect to enjoy the advantages of the friendships it allows, but also be subject to its control. That is unless they maintain the relationships required to be voted the head of the council and get to pick the decrees themselves. Overall players that opt to follow the Empyrean will find it plays differently than other religions. It is a powerful force if the player is able to maintain strong diplomatic ties. Converting players to good or neutral alignments and keeping them on the Overcouncil allows for diplomatic alliances that don&#8217;t exist in earlier version of FfH. Warmongers that simply want to capture the nearest empire (regardless of their alignment or effect on diplomacy) will probably find it difficult to tap into the Empyreans true power. In my games I&#8217;ve gone after two different strategies, either passing out the Empyrean and gifting the honor tech to everyone as soon as possible (with tons of disciples and such) to create a world united on the Overcouncil. As long as I can maintain leadership with a world of competition this works great and my ability to crush those few that don&#8217;t comply works really well. Lately I&#8217;ve been going for a more targeted strategy. Pick 2-3 strategically significant partners and just pursue them as Overcouncil allies. This makes the Overcouncil easier to control and as long as no outside empire or group of empires forms up against us we are usually able to maintain as well. I&#8217;ve grabbed all my surrounding empires for this, then adopted a builder strategy since I can direct my neighbors into wars with those that threaten me. An oddity among the religions the Council of Esus has no disciples, priests, high priests or temples. Instead all of its abilities are practiced by units that worship the religion. Any unit that worships Esus can pay to spread religion in a city. That theme, paying for miracles, is common in the Council of Esus. Gibbon Goetia- Gibbon is the hero of the Council, an illusionist with the Impersonate Leader ability. 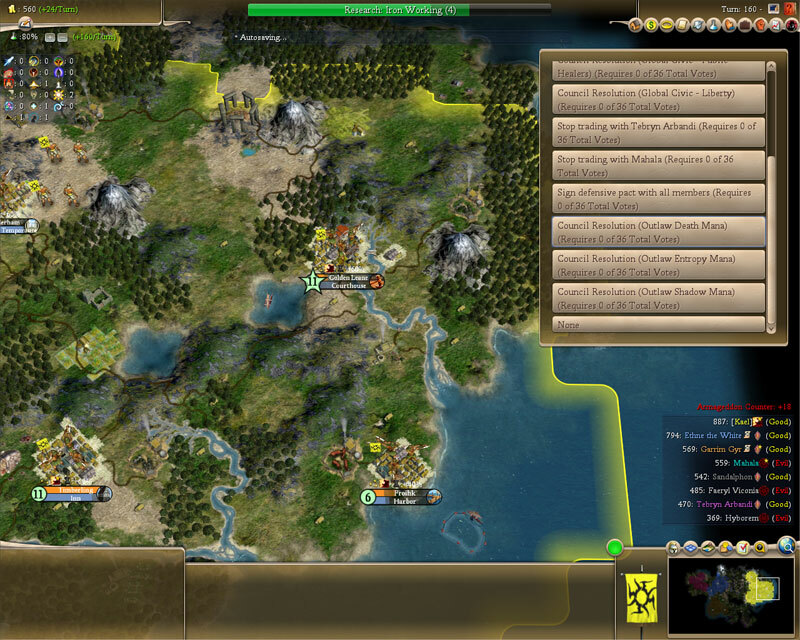 Using the ability sacrifices Gibbon but allows you to take control of another civ for a few turns. While you are in control of another civilization there are some things you cant do (you cant disband their units, trade away your techs, etc) but you do have considerable control over how they act. 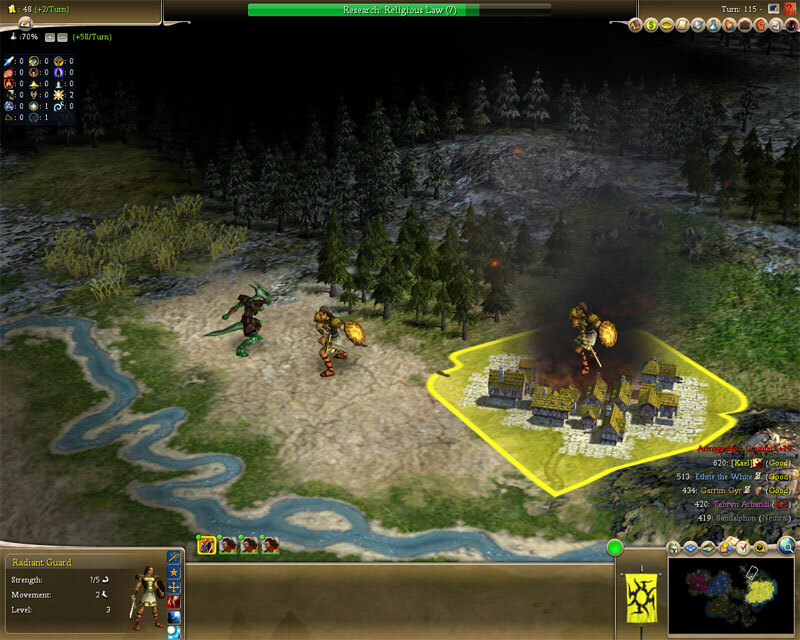 Take over a civ to push them into war with your enemies, or move their units away from targets you would like to capture. 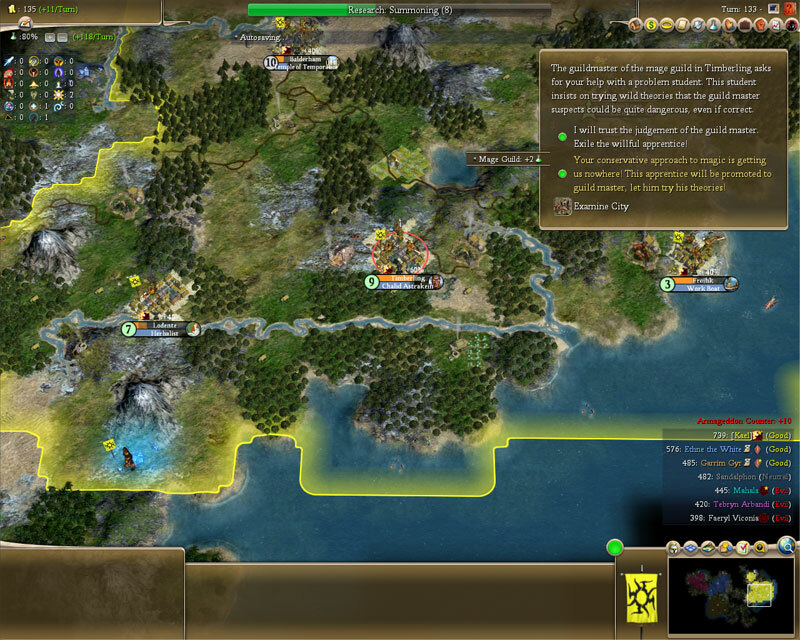 When the random period of control is ended you are returned to controlling your original civ. The Council is a hidden religion, meaning that only other players with the Council as their state religion will know you are following it. So you avoid the negative attitude penalty for having a religion opposed to non-Council players while getting the bonus from Council players. The Undercouncil serves a similar purpose to the Overcouncil. Like the Overcouncil it is founded by using a prophet or a merchant (in &#8220;shadow&#8221; prophets can build all the holy shrines while many shrines have a 2nd great person that can also build them) to create a shrine in the Council of Esus holy city. It can only be joined by Neutral or Evil players, and although they don&#8217;t have to worship the Council of Esus to join, they can&#8217;t be members of the Overcouncil. A true equipment system has been added in &#8220;Shadow&#8221;. No longer will killing Orthus with a fireball result in the loss of his axe, instead it drops on the ground right where he stood. We are not implementing &#8220;common&#8221; equipment. We have no plans to allow players to start manufacturing and outfitting their units with a variety of swords, bows, horses, shields, etc. Though that is certainly possible with this system. Rather we want to use them for special, powerful objects. A Healing Salve can be purchased through a rare event and heals the unit that consumes it completely. Orthus&#8217;s Axe is obviously equipment now, but Hyborem also has a trident that grants +2 unholy and vulnerability to holy damage to its wielder. Barbatos also has a staff that grants death affinity, and Donal Lugh has a shield that gives defensive strength. 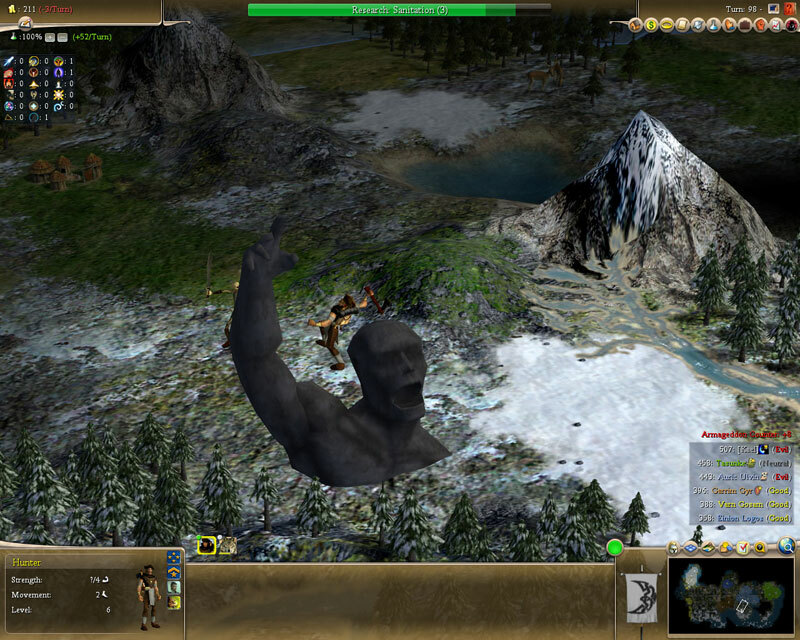 Some equipment can be added to cities. These are all wonders you are familiar with, the Infernal Grimoire can be carried as equipment and read to produce random results, the Crown of Akharien protects any unit that wears it from magic, Sylviens Perfect Lyre and the Dragons Horde don&#8217;t give the unit that carries them any special benefit but since they are equipment they will be spawned if the city is razed to be collected, and the owner can always pick them up and take them to other cities if desired. There is a reason I decided to talk about the Council of Esus and Equipment at the same time. Recon units that worship Esus gain the Steal ability. This ability gives them a chance to steal equipment from a city or other unit in their stack. If successful they get the equipment, if it fails war is declared against that civ. The public polls for the design contests have been posted. Be sure to go vote for your favorites entries. This is the area of &#8220;Shadow&#8221; that I am most interested to hear feedback on. Guild don&#8217;t have many similarities to their BtS Corporation brothers. We borrowed some of the functions, but little of the actual implementation. Guilds in &#8220;Shadow&#8221; don&#8217;t provide resources or follow a unified model, each was designed to perform different functions. Before I list the guilds I want to talk about one of our design structures for &#8220;Shadow&#8221;. We tend to design loose structures and then fill in the exact implementation of that structure as we go on. The structure (which doesn&#8217;t have any game relevance) inspires the design and maintains a design consistency that would not be possible if we were just adding in cool ideas as we thought of them. In creating the Event structure Loki came up with the following event types, Rebellion, Judgement, Inspiration, Crime, Economy, Deals and Prophecy. Then we assigned each Religion a strength and a weakness to each event type (Octopus Overlords for example has a strength in Prophecy and a weakness in Judgement). Strength and weaknesses in an event type is considered whenever an event is created. So a positive Prophecy event may only trigger for OO players, or OO players may receive a better option to deal with a Prophecy event, or having a temple of the Overlords in a city may affect a prophecy event, etc. Weakness to an event type may mean that the player won&#8217;t receive a positive event of that type, or will be forced to pick a bad option for that event. Of course a design structure isn&#8217;t intended to be 100%, it&#8217;s only a guideline. We are free to break it if it is better implemented differently. But we hope by having it that there is some feel for overall logical consistency as you play. So a Runes player will run into different event challenges and opportunities than an Order player. Founded by- Event, an Assassin of sufficient rank can become Aeron&#8217;s Chosen, which allows him to found the guild. Spread By- Assassins can spend money to spread the guild into other cities. Effect- Boosts xp of all recon units created in the city. 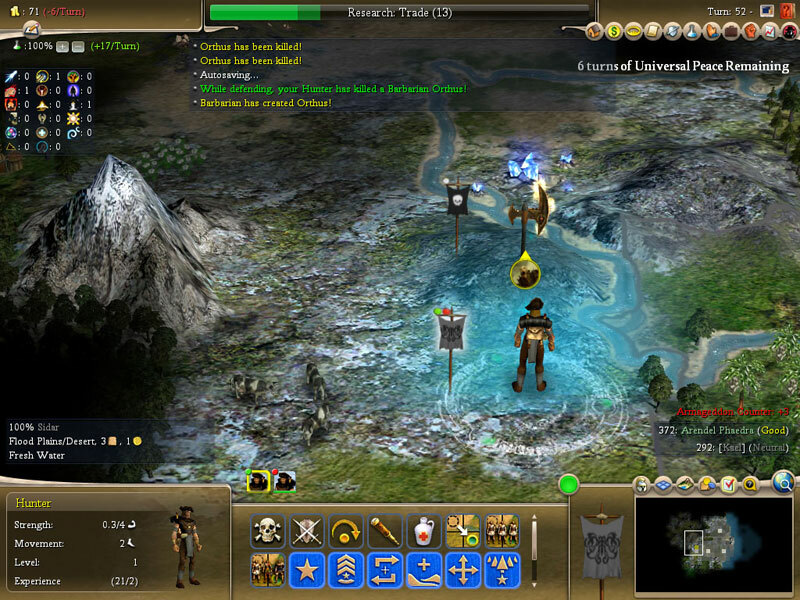 Founded by- All mercenaries can found Guild of Nine locations, the first creates the headquarters. Spread By- Mercenaries can spread the Guild of Nine to other cities. Effect- Event, allows the player access to positive events that allow them to purchase units. Also players can always hire mercenaries in Guild of the Nine cities. As I mentioned I&#8217;m very interested to hear feedback on the guilds implementation. The linking of religions, events and guilds makes it a much broader mechanic than simply adding 7 guilds each with a specific effect. There are currently about 130 events in &#8220;Shadow&#8221; and I expect that number to triple before the final version. The guilds themselves are meant to be relatively minor game aspects (we don&#8217;t want them to swing games) but bring out the flavor of the world more than spotlighting big mechanics. Given enough time ancient towers now upgrade to castles. These defensive range bonuses are disabled if an enemy unit occupies the fort. The AI has been adjusted to scatter the occasional Fort around, but never clump them together (this was the hardest part of setting up this system). Since we link into the terrain defense modifier system (the same system that says hills and forests grant defense bonuses) the AI does a good job of preferring to move through tiles that have &#8220;fort cover&#8221;. 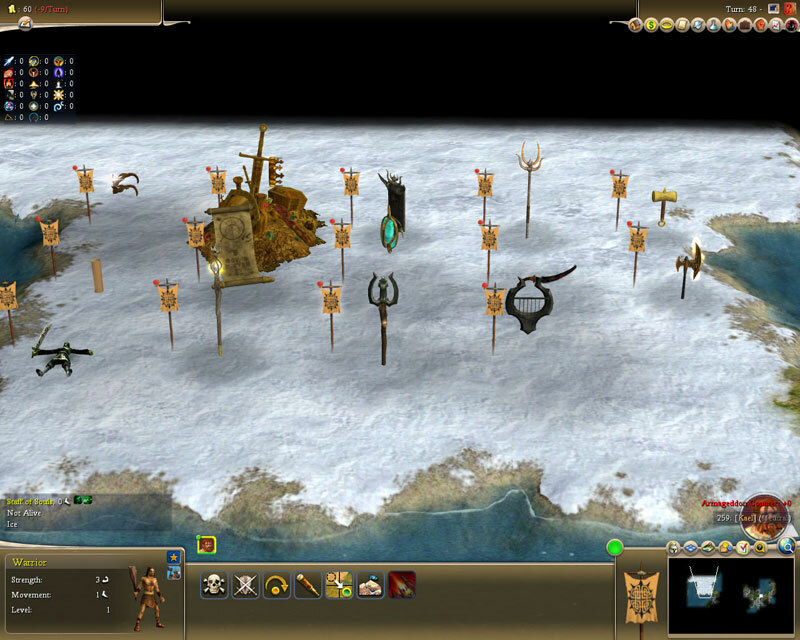 We also tweaked the AI so that in times of war it will station units in forts to maintain the bonus. We are considering also having fort/castles/citadels protect surrounding tiles from pillaging and AA had the idea to give allied units a defensive withdrawal chance that allows them to retreat into the fort if they are about to die. Neither of these ideas has been implemented, I want to get all of your thoughts of forts as they are first, but we may consider them in future versions. Design a Unit 3: Verdian for his entry "Divided Soul"
Design an Event: Xuenay for his entry "Commerce Feud"
Design a Wonder: Kol.7 for his entry "City of a Thousand Slums"
I wanted to take a day to talk about the things that have been removed from "Shadow". Everybody will find some things on that list that they agree with, and some things they don't agree with. We are adding tons of stuff, but to keep FfH from becoming a disorganized mess we have to trim the fat as well. Sometimes cutting a medicore object from the game improves it as much as adding a good one. 1. Removed the Council of Esus wonder (its now a religion). 2. Removed the Cult of the Dragon religion (its now a cult). 3. Removed the Guild of Endeavors wonder (replaced with the Guild of Hammers). 4. Removed the Twisted Spire wonder (this doesnt justify its own wonder in FfH because we have less religious buildings than vanilla, we may reuse the effect combined with more abilities in a new wonder). 5. 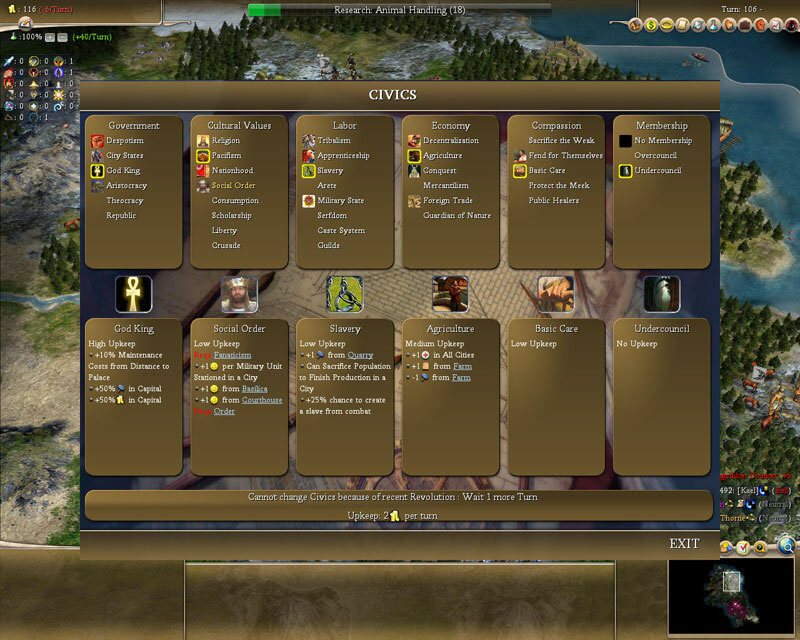 Removed the Education civic option (those options in this category i liked fit better elsewhere, the rest were boring). 6. Removed the Religious Discipline civic (merged with theocracy). 7. Removed the Military Discipline civic (merged with military state). 8. Removed the No School System civic (boring). 9. Removed the Pikeman unit (UU's preserved, mounted units dont need a foil and pikemen were boring, we renamed the macemen unit to a champion unit and used all the macemen and pikemen uu's as champion uu's, champions upgrade to paladins, eidolons, immortals, berserkers and phalanxs). 10. Removed the Metal Casting tech. 11. Removed the Monarchy tech (combined with Feudalism). 12. Removed the Alchemy tech. 13. Removed the Golem Mastery tech. 14. Removed the Copper Golem unit (this is just a holdover from the pre-luchuirp days). 15. Removed the Golem Workshop building. 16. Removed the Thieves Guild building (redundant with all the new crime mechanics). 17. Removed the Dwarf Slaying promotion (to specific to be useful). 18. Removed the Elf Slaying promotion (to specific to be useful). 19. Removed the Orc Slaying promotion (this is to useful in raging barb games). 20. Removed the Unquestioning Obedience tech (boring). 21. Removed the Patriarch mechanic (removed the patriarch promotion, become patriarch spell and call holy war spell) as those design aspects are better represented through the councils. 22. Removed the Monument building (consolidated with the Obelisk). 23. Removed the Shield Wall unitclass (defense is the province of archer units, it didnt make sence that the attack line ended up with the best defender). 24. Removed the Arcane Golem unit (shield wall uu that I never really liked). 25. Removed the Lames tech. 26. Removed the Armorer building. 27. Removed the Armament Molds building. 28. Removed the Flurry unitclass (it didnt make sense that the defense branch got a strong attacker in the final stage, the elves keep a flurry uu so they retain the strong archer attack, everyone else loses it). 29. Removed the Celerity tech. 30. Removed the Velox Workshop building. 31. Removed the Heavy Crossbowman unitclass (crossbowman are now a t4 unit, basically crossbowmen are what heavy crossbowmen used to be, longbowmen upgrade to crossbowmen, arquebus and marksmen). It may seem like we cut a lot but I think the game plays better with the changes. Especially the tech tree tuning makes things roll out a more evenly (there has been some significant tweaking of the tech tree, tech requirements and where things lie). Cutting unitclasses helps the art team and really dumps a lot of units that weren't pulling their own weight. I'd rather spend time on civ specific uu's then make everyone have access to some unit that isn't really used (like pikemen and shield walls). When is the "team members get grubby hands on Shadow playtest version" date? December 16th??? Have you gone insane??? Any info about possible 0.26 version? or new bug fixes??? There won't be a 0.26 or another patch for 0.25 (unless something major breaks). From this point on all my attention is on getting "shadow" ready for release. 6-7 weeks isn't that long (at least it doesnt feel like that long when I look at how much we have to do before then ). hehe fun, always someone that asks for a couple of days earlier . The other half remember way back last winter when they were waiting for Fire. This phase will come quicker thant the previous since we aren't concurrently working on AoI. A really short time period actually if you consider all the new animations I wanted to do plus working on WH, I really wished it were still April! Minor errors reports are still coming in pretty steady through on the .25k/l version. Are you still tracking these and working on fixes, i assume to be placed in Shadow? ... and you want to be on schedule??? After all, it is NOT a commercial mod, and they do NOT have to "release" for a marketing window. ... so please, use this schedule as an internal milestone, but first and foremost do NOT speed up a process for racing on a date: QUALITY FIRST. Thousands of us have voted for having this mod ranked NUMBER 1. It is not because it is the fastest, but the best. Oops! English is not my language! If I say sthroumpf and it means sploushh to you, don't destroy me right away!! I don't post a lot however, THANK YOU. I have played this mod for a long time and it has survived many other games I have bought. Truely a fun and interesting game(Mod). Dude, you might want consider your words before posting next time - your tone is a bit harsh in this unforgiving medium. 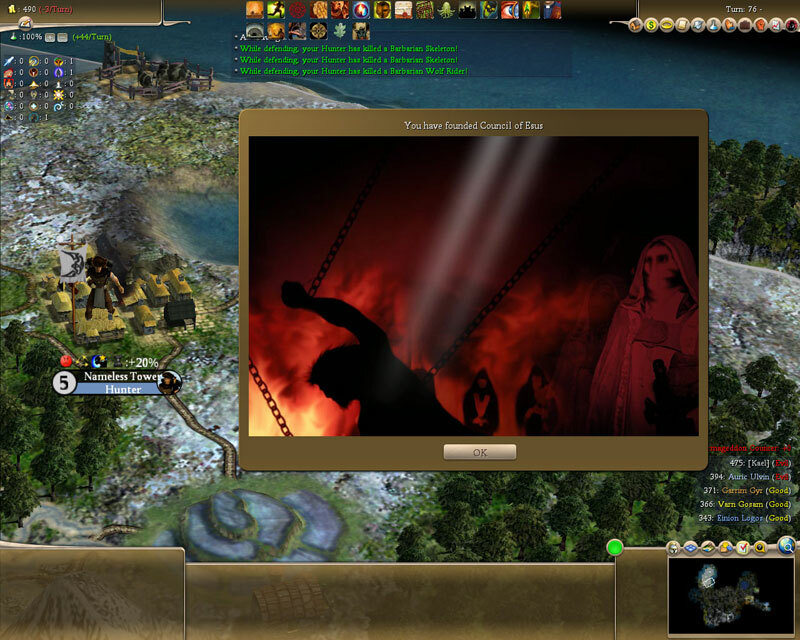 Fall from Heaven II will be an incomplete mod for Civ IV until it is done Shadow and Ice, two phases that are remaining for this mod that is currently in Beta. Yes, we are all beta testers for this wonderful mod. I haven't seen any game-breakers. There will always be bugs in software. If you wait until they are all quashed, you'll never release. Why fill out the 'pedia when the mechanics are still changing? This has been mentioned many times. The Wiki is a free community-led addition for this free mod - it is not officially part of the mod itself. That means if there is something wrong with the Wiki, then fix it. Heh, I guess I understand now. You must not have spent much time in this forum or with this mod. Those incomplete civs will be completed in the next two phases. It's all a part of the schedule that's been posted and talked about many times. Yes, this is on-going, just like everything else. I'm sure it's hard to take a fanboy's words to heart, but I really think Kael and Co. have done a great job with their release and test schedule. It has allowed us all to join them on the journey of developing a mod that is a game unto itself. I'm broken. No other computer games 'do it' for me anymore. I've tried buying some. I've tried downloading others. But no sooner have I started playing them than I'm thinking about this again. My Fall from Heaven research thread can be found here. "Dude, you might want consider your words before posting next time - your tone is a bit harsh "
Sir (not "dude"), I am afraid you misunderstood the point. It is not a complain, it is a reminder for quality. I see nothing wrong with this and your long reply hits the wrong target. When you reply to the (*) points 1 by one, I just give facts that are in the 1st post of the bug thread (2things to do"), recalling that there is lot of work to do, and it is a warning also to any poster who wishes to have an early release: there is a lot of work to be done, and no one should be too formal about a given date. Obviously you were not reading the BTS thread where we "lost" Alexman, when he kindly introduced the 3.13 changes, and he got flamed because the patch did not come "on time and as promised"
On another note, calling a poster "dude" on a forum is probably the most uneducated and annoying thing one can do.